I went to the Rockets-Grizzlies game Friday night, which was a blowout the Rockets won going away 103-87. It wasn’t even that close as the Rockets got off to a hot start, opening up an incredible 30-point lead early in the second quarter. Kevin Martin was incredible, scoring 22 points in the first quarter. Kyle Lowry scored 15 points and had a career-high 16 assists, along with 5 steals through 3 quarters. Of course, the big news was the announcement today that Yao is done for the season, which is no surprise, and the press conference the Rockets had before the game with Rockets’ team doctor Dr. Walter Lowe and Rockets’ GM Daryl Morey. Rather than spend time writing about the blowout victory, I went ahead and typed up the press conference transcript the Rockets provided the media before the game. Here are some quotes that didn’t appear in some of the major news stories about the press conference. On how it will affect his plans this season without Yao Ming: “Well, I think , overall we’ve been preparing for this possibility, obviously as doctor said and we’ve talked to Dr. Lowe and Dr. Clanton and all the folks. Also Dr. Yazuki, close to working with Yao Ming. We’ve obviously known he’s (Yao Ming) been prone to possible future inures. So, as you can tell in our preparation, our signings, our trades, our draft picks. We’ve prepared a team to sort of work with Yao Ming and work without, both at a player level and mentality level. I think we have a very resilient group. They’ve been able to fight through injuries and have had winning seasons without both Yao Ming and Tracy McGrady last year. This year obviously we’re gonna have Yao Ming for mostly not this whole season. We feel like we have a resilient group to work for guys that can fight through injuries and we feel like we’ve got a young team that each day they play, they’re better than the day before. Not a team that’s declining but a team that’s improving. On what kind of rest Yao should take after this injury: “I’m not the foot and ankle guy, which is okay. But, at the same time I do think the suggestion or the usual course of action for this particular stress fracture, which is a vertical fracture through the medial malleolus is that it would be fixed. I think that’s the smartest course of action. I’d put it in one of those 4-6 month recoveries. For a stress fracture to heal completely, it should take that 3-4 month period, and then there’s, as you saw with some other things in Yao, a very slow, progressive return to higher and higher unloading. So, that’s for sure in that 4-6 month window after it’s fixed. The Rockets did something Friday night they hadn’t done all season long: win a game after winning an even bigger game. In other words: not have a letdown. Two days after beating the Lakers, the Rockets went to Memphis for another test of their mettle. That’s because on 3 different occasions this season they had let us down, not showing up when we thought they had turned the corner. Remember these games? What they DID get that’s more sustainable over the long-term were performances from players we have expected great things from this season. Kyle Lowry scored 28 points against his former team, hitting 11-of-15 from the field and 4-of-5 from 3-point land for 28 points. Hitting 4-of-5 is incredible considering Lowry had only made 8 of 31 shots (26%) from behind the arc for the season. He balanced out that long-range shooting by scoring 12 of his points in the paint. Lowry also had 12 assists, which tied his career high. Kyle Lowry scores two of his career-high 28 points against the Grizzlies. Click here for more photos from the game. Lowry’s backcourt mate Kevin Martin delivered with numbers we expected from him when he was acquired: 28 points on 11-of-15 shots, and 5-of-6 on three-pointers. Getting 56 points from your backcourt is reminiscent of what the great teams in the NBA can get. Brad Miller proved how great of an acquisition we thought he would be with 23 points on 7-of-7 shots, including 3-of-3 from long range. There’s not much more you can ask from your backup center in just 24 minutes of play. Luis Scola was a solid 6-of-11 for 15 points. Courtney Lee had one of his best games of a Rocket, hitting 7-of-9 shots for 16 points. Even former Grizzly Shane Battier had another great game shooting following up his awesome game against the Lakers with 12 points on 4-of-8 shots, making 2-of-3 three-pointers. The only player left out of the party was Chase Budinger, who was just 1-for-5 from the field for 3 points. But in the long run, these things tend to even out, and there will come a day where Chase will bail out his teammates with hot shooting like Lowry and the other players did Friday night. Having passed the test of winning a game after a big victory over a team like the Lakers, Houston fans are now looking to see if the Rockets can do it again, this time against Chicago on a back-to-back facing one of their toughest match-ups in the league: Derek Rose, who lit them up for 33 points last time. Carlos Boozer is also back in the line-up, but the Bulls have lost 3 of their last 4 games. Fortunately, Kevin Martin has averaged 26 points in his last 3 games in Chicago. The Grizzlies may have beaten the Rockets in their second and third matchups this season along with their bench outscoring Houston’s 109-54 in those games, but I knew before their final game Sunday night that it was going to be payback. Memphis had their young studs like Rudy Gay, O.J. Mayo and Mike Conley rolling in those games, but this time I knew the Rockets’ young guns were going to get payback. Aaron Brooks, Carl Landry, Von Wafer and former Grizzly Kyle Lowry all came through with strong games (32 points in total) Sunday night. Throw in the consistency of double-doubles from Yao Ming (24 points on 9-of-13 shots, 17 boards), Luis Scola (18 points, 14 boards), Ron Artest (13 points on 5-of-10 shots), and a little bit of swagger playing at home where they had won 11 in a row, and you get a 93-83 victory for the Rockets. 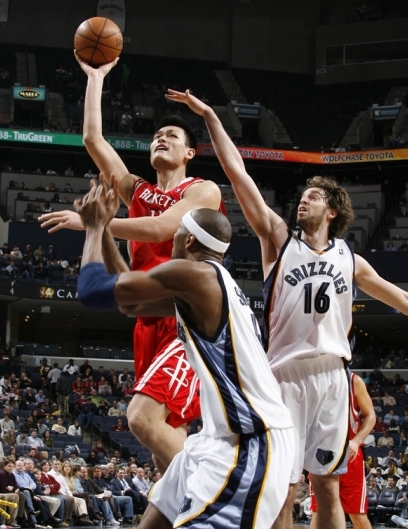 Yao Ming blocks the shot of Marc Gasol, one of 3 blocks that Yao racked up during a win. Click here for more photos from the game. Houston led 28-19 after the first quarter, by 18 points after the 2nd and 3rd quarters, and it was just matter of time before the Rockets put the game away so Brian Cook and Brent Barry could get into the game for garbage time at the 4:27 mark with Houston up by 25 points. Those 2 losses earlier in the season really hurt, but this win puts a little salve on the wound. In the first loss to Memphis in December, the Rockets’ defense was terrible, Artest didn’t play, and Luther Head was 1-for-8. In the second loss on February 4th, the Rockets’ defense was bad again, especially in defending Mayo (32 points) and giving up 53.3% shooting. On offense, McGrady was 0-for-5 from 3-point land, Artest only scored 5 points on 1-of-10 shooting, Wafer had only 5 points, Landry didn’t score, and Brooks didn’t play. It’s amazing how much has changed for the Rockets since then. It’s like they’re a different team, having gotten younger with the aforementioned young guns, and no longer having two players in the lineup who were like a box of chocolates, wondering what you’re going to get. Let’s face it. Everyone is sick of the inconsistency of the Rockets. All the fans, the players, the coach, the front office, the media, you name it. After the Rockets lost their second game this season to the woeful Memphis Grizzlies, one of the worst teams in the league, the Rockets have reached a new low with a 104-93 loss Wednesday night. Houston has now lost 7 games this season to teams that have had some of the worst records in the league: Memphis (2), Indiana, the Clippers, Washington, and Philadelphia (2). They are also only a pathetic 14-13 against teams with losing records, and 14-7 with winning records. Yao Ming tries to defend against O.J. Mayo who constantly blew by Rocket defenders on his way to scoring 32 points. Click here for more photos from the game. Entering Wednesday night, The Grizzlies were a 12-35 team that had lost 7 consecutive HOME games, and had lost 12 in a row before winning Monday night on the road against a terrible Washington team. They are so bad, hardly anyone in Memphis is showing up for their games. There were tons of empty seats in the lower bowl the whole game, drawing only about 10,000 fans. The radio talk show lines are burning up in Houston, and the natives are restless. I’ve seen it before, and I can just about guarantee that “change is coming,” to borrow a phrase used often over the past few months. I’ve been pretty quiet on this blog over the past few weeks, with me intentionally not getting too involved with the details of the preseason Rockets, and instead focusing more of my time on work, as well as the election. Like many of you, I’m not a big fan of the preseason – it’s way too long and not indicative of how the regular season will turn out for most teams. But something magical has happened over the 24 hours. The juices started to flow in anticipation of Wednesday night’s regular season opener for the Rockets against the Memphis Grizzlies. It’s now time to get serious as the Rockets prepare to launch a winning campaign of their own with their new running mate, Ron Artest. [Click here for Raymond’s photos from the excitement of opening night]. It wasn’t pretty, but the Rockets overcame a disjointed offense to win 82-71 with their defense — ironically the thing that concerned them the most at the end of the preseason. The 11-point margin makes it seem like a bigger win than it really was. It was much closer. 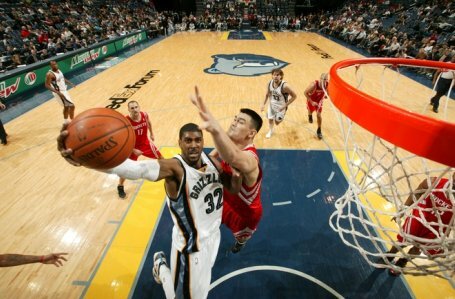 Houston’s defense made an early statement against the Grizzlies offense when they stole the ball 3 times in their first four possessions, with Ron Artest getting two of them. This display before their very eyes of one of the league’s most celebrated defensive players whipped the fans in Toyota Center into a frenzy as the Rockets took an early 7-0 lead. I myself couldn’t contain my excitement as I envisioned what an extra 2 or 3 steals per game from Artest will mean to the the Rockets’ cuse this season. The lead expanded to 11-2 thanks to an active Yao Ming grabbing two offensive boards for a tip-in and dunk. Yao’s performance Wednesday night would remind everyone just how much he was missed during last season’s playoff series loss against the Utah Jazz. Anytime you take out of the lineup a game-high 21 points, 10 rebounds and 9-of-9 shooting from the free throw line like Yao had Wednesday night, you’re not going to be near as competitive against a playoff team like Utah. Welcome back, Yao. We’re glad to have you. Houston looked like they were well on their way to a blowout against a young Memphis team after building a 26-18 first quarter lead. But then Houston’s offense went south with Houston’s second unit getting more action, hitting only 4-of-21 field goals in the second quarter for 17 points, and scoring only 15 points in the third. 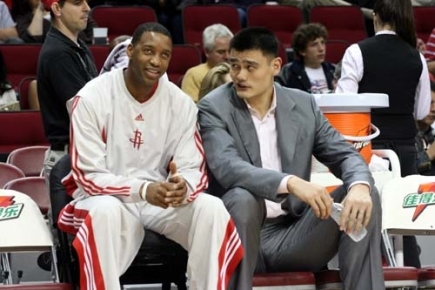 Yao Ming talks with Tracy McGrady before the Rockets try to win their 14th game in a row that would give the team an undefeated record for February. ‘Mission accomplished’ as Houston soundly beat the Grizzlies 116-95. Earlier in the day, Yao Ming flew to Charlotte, North Carolina to get a second opinion of his injury from another doctor, then returned the same day to cheer his team to victory. Click here for more photos of Yao before the game. There’s something about this Houston Rockets team that is unique from many previous editions. For example, there was a time when you had to get nervous about them reaching a milestone (like winning all the games in a month, or lay claim to the longest winning streak in an NBA season), even against a poor team like Memphis. Like most Houston teams (except for a few exceptions), they just couldn’t stand too much prosperity, right? Not these Rockets. Houston took care of business and put the Memphis Grizzlies away early by exploding with a fast break offense, and clamping down on defense to take leads of 14-0, 20-2, and to lead 37-17 by the end of the first quarter. After that, the Rockets cruised to a 116-95 victory to win their 14th game in a row. Since the 1991-92 season, only five other NBA teams have won all their games in a month. They also beat Portland’s 13-game winning streak earlier this season. Houston’s victory Friday night positions the Rockets to tie a franchise record of 15 in a row Sunday night against Denver. The way the Rockets are playing, you’ve got to be as confident as you can be they will deliver on tying that record as well as break the franchise record against Indiana on Wednesday March 5th. All this success lately makes you take a look back at all the acquisitions and draft picks the Rockets have made to build their current roster, and how almost all of them have turned out as good as could be expected. It would be hard to name one player who has underachieved during this 14-game streak. From Yao to Luis Scola to Carl Landry to Dikembe Mutombo, all the way down to Aaron Brooks and Steve Novak (too numerous to name everyone). 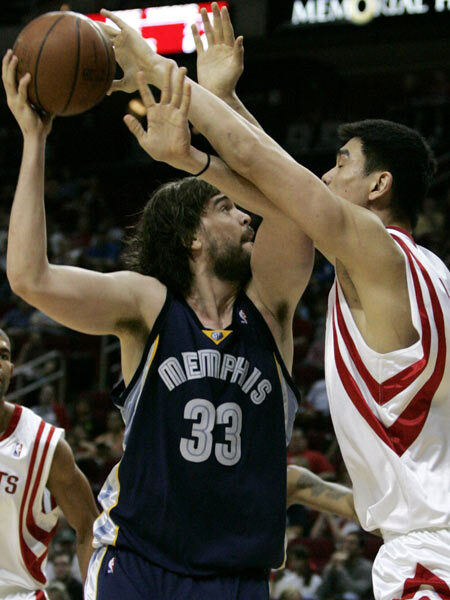 Yao Ming shoots over Memphis’ Stromile Swift and Pau Gasol on his way to 22 points on 9-of-15 shooting in a convincing Rockets victory over the Grizzlies. 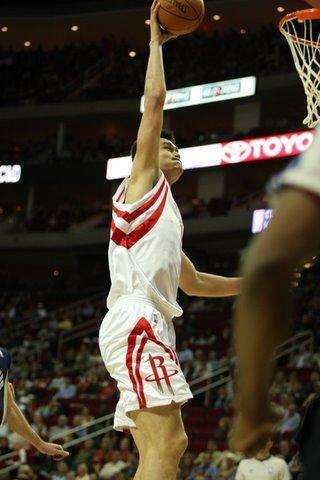 Yao also finished with 12 rebounds and 5 blocks. What else can be said other than the obvious? Although they were playing against a struggling 8-20 Memphis team, the Rockets played very well Friday night in the absence of the injured Tracy McGrady, and beat the Grizzlies soundly 103-83. It was another good performance by the Rockets without McGrady around (remember the 2OT game against Denver last week where the Rockets played pretty well? ), and you’ve got to think it’s not just a coincidence. As much as I see on Internet Web sites comments from Rocket fans saying McGrady should be traded, I have been a little more conservative on that notion (shocking, huh?) because I have thought if McGrady doesn’t go crazy with stupid jump shots, he can still be a very effective weapon. But I think there is something even better that’s happening when the Rockets play without him. Unlike last year, other players now seem to be stepping up in his absence. Part of the reason is because the talent on this roster that the front office has assembled seems much more comfortable stepping out from behind McGrady’s shadow. 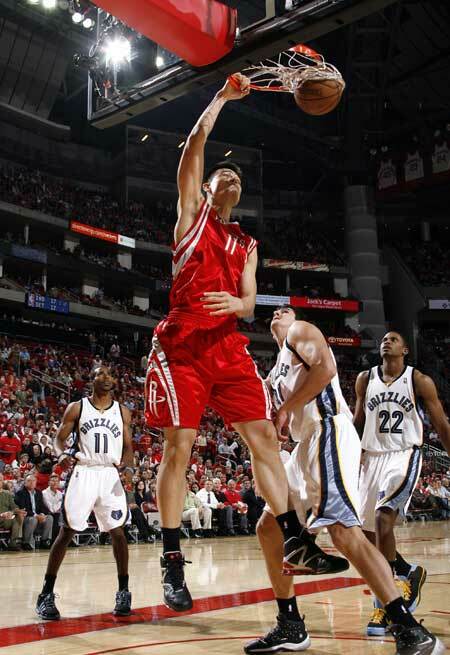 Yao Ming throws down a one-handed tomahawk jam in the first half of the Rockets game against the Memphis Grizzlies. After 3 days off to rest and prepare, the Rockets’ team shooting improved to 51% for the game for the W. Click here for more photos from the game. I had to work late on Wednesday night that overlapped with the Rockets-Grizzlies game. Then when I got home to watch the game on my DVR, I got sick to where I’m not able to write a full report like I normally do. But I’ll try to gut this one out. After losing to the Grizzlies on November 13th in Memphis, the Rockets got some payback by easily defeating the Grizzlies 105-92 on Wednesday night in Houston. I was a bit concerned the Rockets would come out lethargic, similar to the last time the Rockets had 3 days off and didn’t look like they had done any preparation in a loss to Dallas on November 21st. The big key to this victory was the re-emergence of Bonzi Wells (24 points on 11-of-14 shooting), who many people, including myself, had written off that perhaps he was going to sprial downward the rest of the season. Bonzi was phenomenal in the second quarter when he scored 12 points, and looked like the same Bonzi who had destroyed the Spurs in the fifth game of the season. Although he had shorter guards trying to guard him Wednesday night, he still looked like a totally different player from the guy who had been missing so many shots during his slump lately. 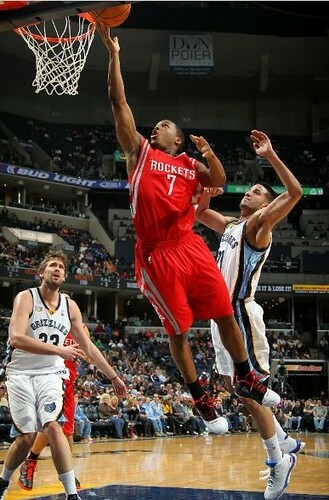 The Rockets went back to their old style of play Tuesday night in a 105-99 loss to the Memphis Grizzlies. I swear, if Rick Adelman hadn’t been seen on the bench, I would have thought I was watching the 2006-07 version of the Rockets, but this time with a worse defense. Before I start talking about the Rockets’ offensive struggles, I would be remiss if I didn’t mention a bad defensive effort where the Rockets couldn’t stop the likes of Mike Miller (6-of-11 for 17 points), Pau Gasol (26 points on 6-of-11 from the field, 14-of-17 from the line), Darko Milicic (20 points on 9-of-14 shooting), and Rudy Gay (6-of-11 for 15 points). Memphis was 1-4 team before Tuesday night. They looked like an All-Star squad considering how easy it was for them to make baskets. I had hoped the Rockets could have made a run at signing Milicic this off-season, but the price tag was way too high. Alot of people like to think that Milicic is a stiff because he never got off the bench at Detroit and people made fun of him since he was such a high draft pick, but that was mainly because the Pistons were a championship team his rookie year, and also because Larry Brown was being too JVG-like and not giving the rookie some playing time. Now he’s proving alot of people were wrong about him. I digress. At least the Rockets got Luis Scola, but Scola’s transition to the NBA game doesn’t appear it’s going to happen overnight. He needs more time, just like Milicic needed. Sorry to say it, but a couple of times Yao Ming got caught napping on defense, like when he allowed Milicic to make a strong move into the lane for a hook shot without much resistance, and then in the fourth quarter Yao easily could have pinned Stromile Swift under the basket after Swift had grabbed an offensive rebound underneath the boards. But Yao let Swift off the hook by jumping up into the air on a pump fake, thus giving Swift the little room he needed to go up and put a shot off the glass for a very important basket in a tight game. Not that I want to harp on Yao for this loss. He made 7-of-12 shots and hit all 8 of his free throws to score 22 points. He was the least of the Rockets’ worries. Instead, let’s focus on a bigger problem that was also evident in most of Sunday night’s game: the offense. Although the Rockets have been on a roll, having won 5 of their last 6 games, and were facing a Memphis team with the league’s worst record Tuesday night, you’ve still got to give them credit for winning 98-90. After all, it was the second night of a back-to-back, Dikembe Mutombo ‘s knee was hurting, Juwan Howard was sick, Bonzi Wells was out, the Grizzlies are averaging 111 points a game since interim coach Tony Barone took over for the ousted Mike Fratello, and they kept coming at Houston.all game long But the Rockets fended them off to sweep the season series. Two post-game conferences in a row with compliments from JVG? I think hell is freezing over. Houston’s offense was very efficient, shooting 49.4% and making 12-of-13 free throws. Three players shot better than 50% (Shane Battier – 6-of-9 for 14 points, Luther Head was 5-of-8 for 11, and Chuck Hayes was 4-of-6). With that kind of shooting, and only 10 team turnovers, you’re going to win a lot of games. Of course, the Rockets’ defense was solid as always, holding Memphis to 43% shooting, and 2-of-18 from three-point territory for 11% shooting, a season-low. Battier was awesome against his former teammate and scoring extraordinaire Mike Miller, holding him to 12 points on 5-of-17 shooting, 0-of-8 from three-point range, snapping Miller’s 27-game streak of making at least one trey. Now the Rockets – who have played their share of cupcakes lately — face a big test on Friday and play the red-hot Dallas Mavericks. It will be interesting to see how well they measure up against arguably the best team in the league. You are currently browsing the archives for the vs. Memphis category.